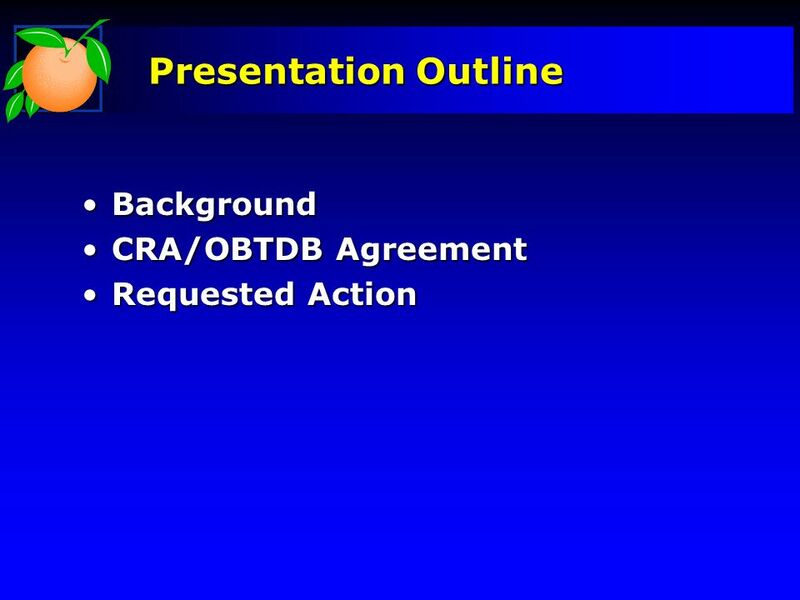 The presentation today will be very brief and follow this outline. 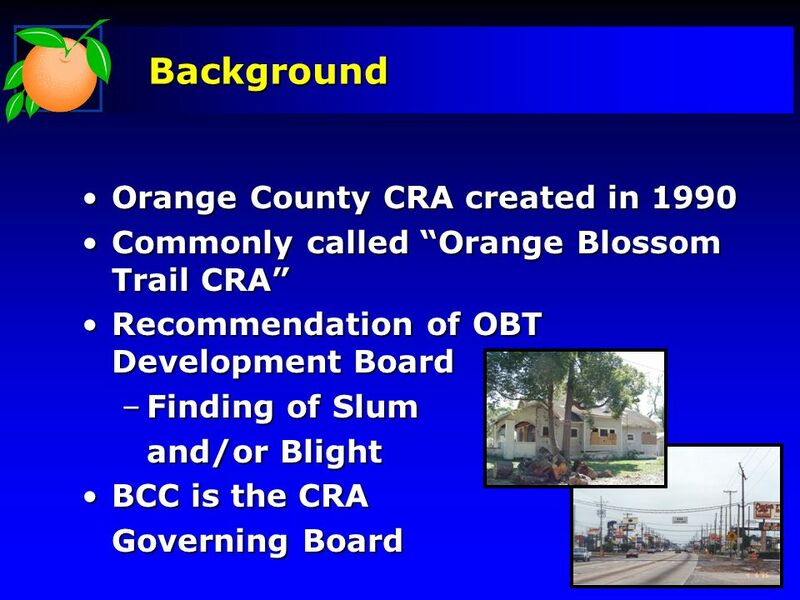 Commonly called “Orange Blossom Trail CRA” Recommendation of OBT Development Board Finding of Slum and/or Blight BCC is the CRA Governing Board The Orange County CRA was created in 1990, and is commonly known as the “Orange Blossom Trail CRA”. It was created initially at the recommendation of the OBT Development Board based upon a finding of slums and blighted conditions in the area. And , the Board of County Commissioners was declared the governing board for this CRA. 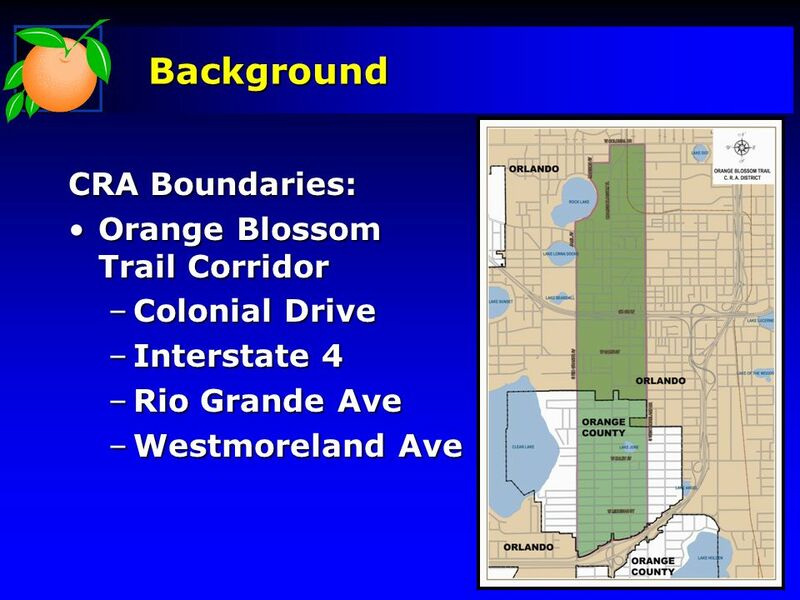 Colonial Drive Interstate 4 Rio Grande Ave Westmoreland Ave The boundaries of the CRA are depicted here…..along the Orange Blossom Trail corridor. Bound on the north by Colonial Drive and the south by I-4. And bound on the west by Rio Grande Avenue and the east by Westmoreland Avenue. 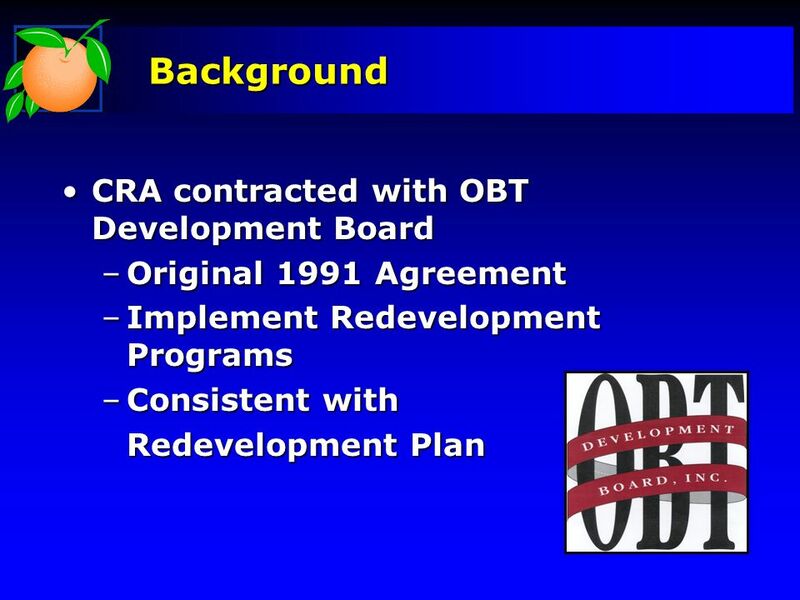 Original 1991 Agreement Implement Redevelopment Programs Consistent with Redevelopment Plan Shortly after it’s creation, the CRA contracted with the OBT Development Board, by an agreement executed in 1991, to implement the redevelopment programs outlined in the plan, on behalf of the CRA. With regard to that agreement…. 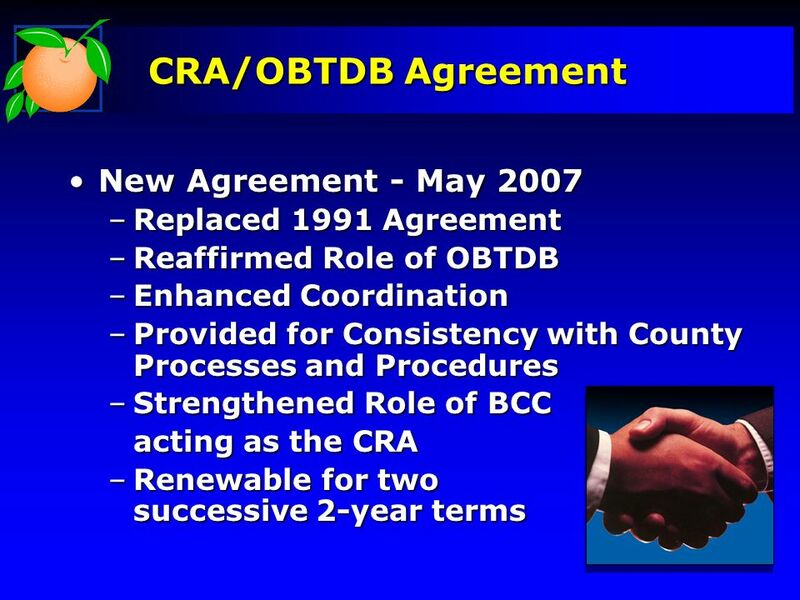 Reaffirmed Role of OBTDB Enhanced Coordination Provided for Consistency with County Processes and Procedures Strengthened Role of BCC acting as the CRA Renewable for two successive 2-year terms In May of 2007, we revisited the original 1991 Agreement, updated it, and replaced it with a New Agreement approved by this Board and the OBTDB. The New Agreement accomplished several things…. 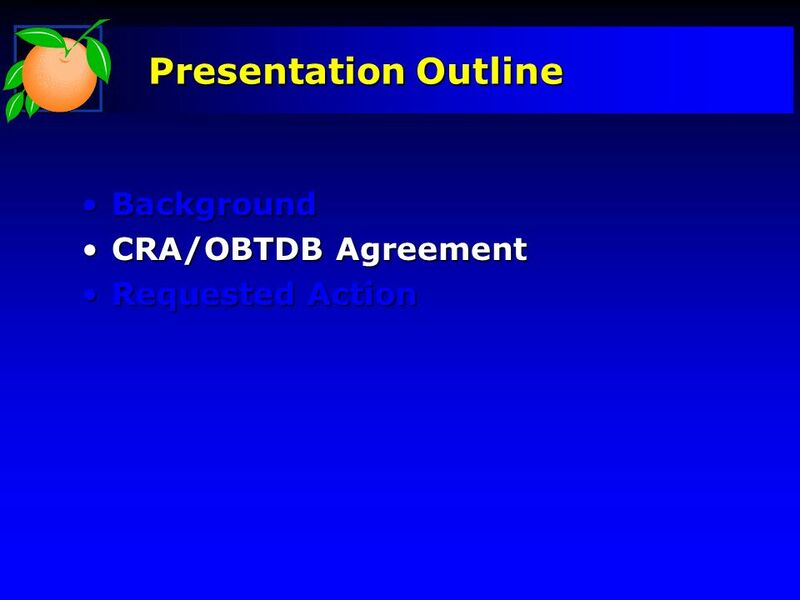 It: Reaffirmed the role of the OBTDB as the implementers of the CRA’s redevelopment programs Enhanced coordination between the OBTDB and County staff Provided for consistency with County Processes and Procedures relating to such things as budgeting and purchasing and contracts. 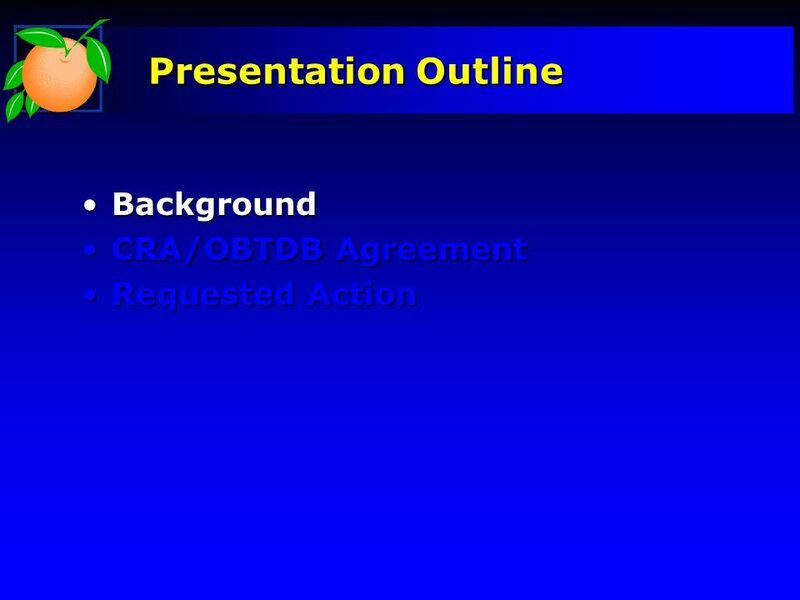 And, it strengthened the role of the BCC acting as the CRA by requiring regular updates and specifying the types of expenditures requiring your explicit approval (you hear from Mr. Grief periodically regarding the progress of the plans and programs that he manages on behalf of the CRA). That new agreement had an ORIGINAL termination date of September 30, 2008 and was renewable for two successive 2-year terms. 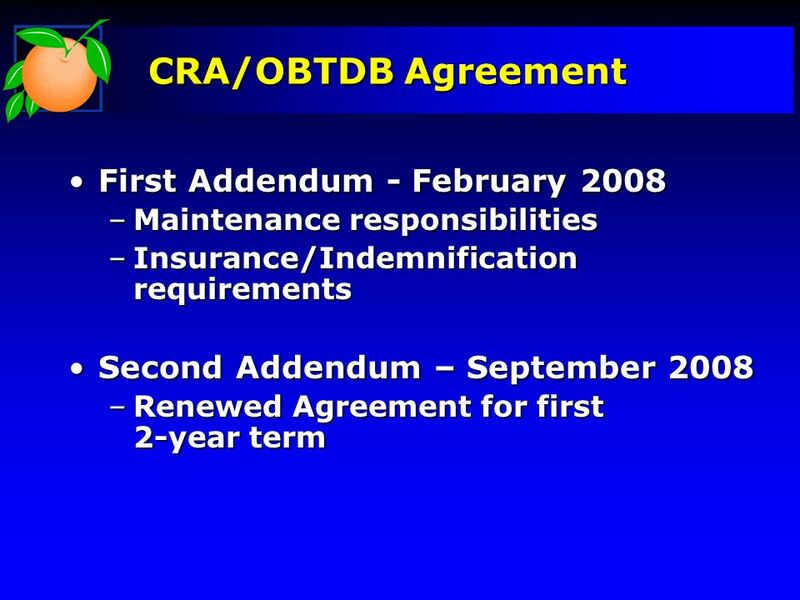 Maintenance responsibilities Insurance/Indemnification requirements Second Addendum – September 2008 Renewed Agreement for first year term There was subsequently a FIRST Addendum to the Agreement which was executed in February of 2008 to specify maintenance responsibilities associated with the Development Board’s maintenance of property that the CRA now owns, as well as insurance and indemnification requirements. 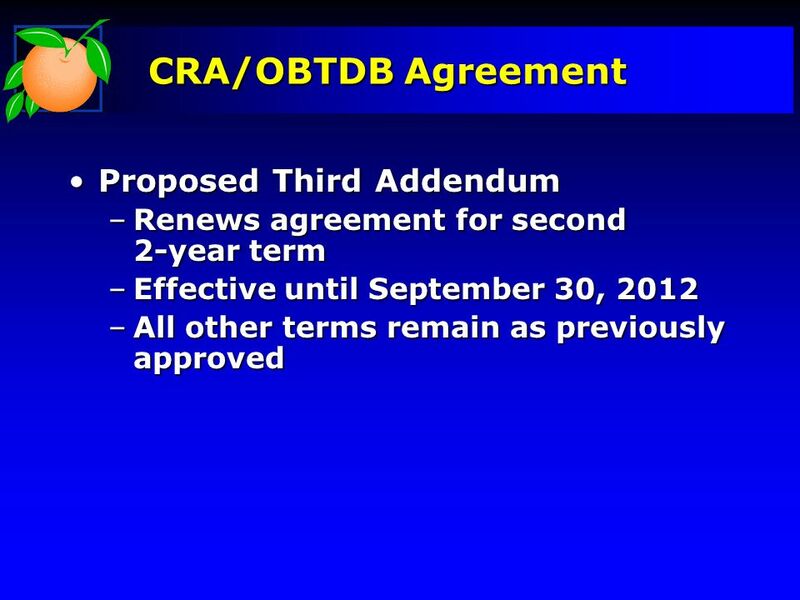 Then, in September of 2008 the Board approved a SECOND Addendum to the Agreement in order to renew the agreement for the first 2-year term (which is due to expire on September 30, 2010). Renews agreement for second year term Effective until September 30, 2012 All other terms remain as previously approved Today, what is before you for approval is a proposed THIRD Addendum to the Agreement which is, again, solely for the purpose of renewing the agreement for the second 2-year term, making it effective until September 30, 2012. All other terms of the Agreement remain as previously approved. 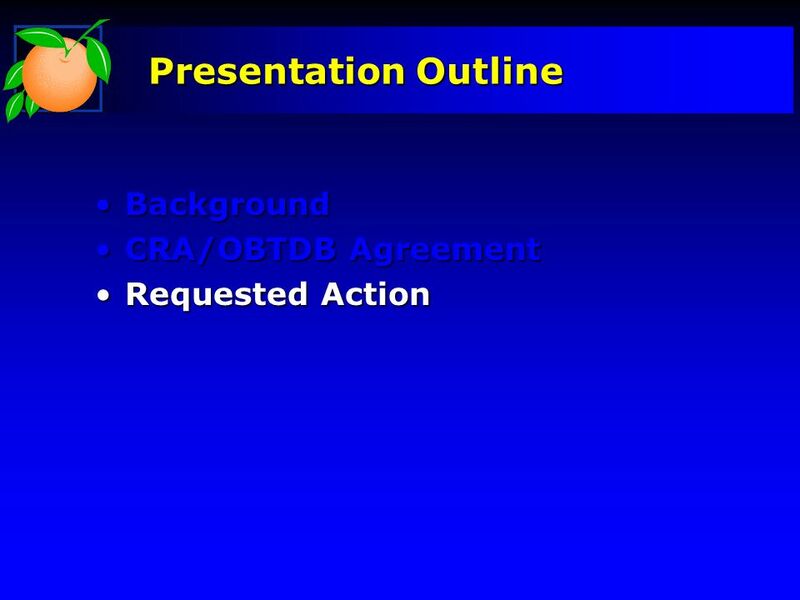 So, the Requested Action of you today is…..
Download ppt "Orange Blossom Trail Development Board"
HOLDEN HEIGHTS PHASE IV FY Budget Worksession July 21, 2008.
INTERNATIONAL DRIVE CRA FY Budget Worksession July 21, 2008. Ninth Amendment to the Orange County / City of Maitland Joint Planning Area Agreement April 17, 2007 Ninth Amendment to the Orange County / City of Maitland. 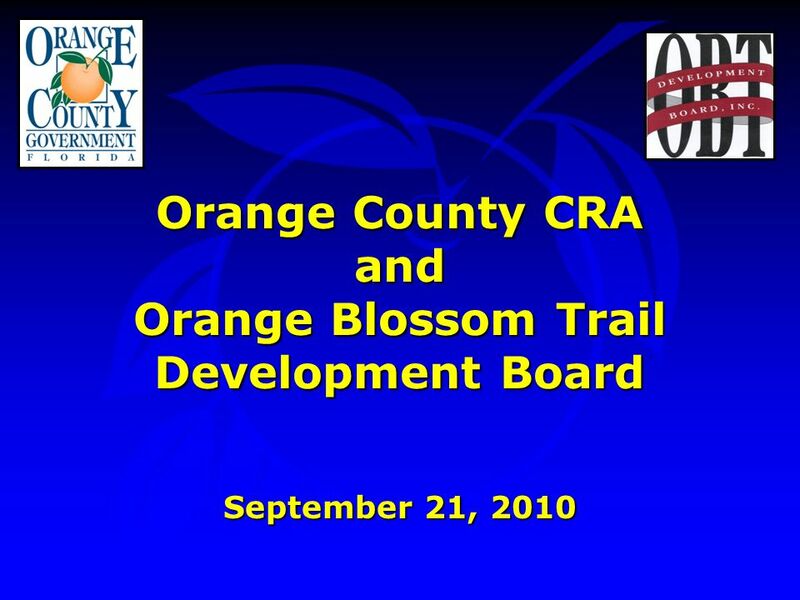 Orange Blossom Trail Development Board (OBTDB) Property Transfer to Orange County CRA February 19, 2008. Economic Development Ad Valorem Tax Exemption Ordinance Presentation to the Orange County Board of County Commissioners February 7, 2012. County of Fairfax, Virginia Department of Transportation Board Four Year Transportation Plan 2012 to 2015 Board Transportation Committee November 29, 2011. Library System Funding & Capital Projects Budget Issues Workshop February 21, 2012. Orange County Board of County Commissioners Water Conserv II Operations Contract Renewal Utilities Department August 23, 2011 Utilities Department August. Holden Heights Community Improvement Project Update Orange County Board of County Commissioners December 17, 2013. 2009 Performance Assessment Member Representatives Committee Meeting October 28, 2008. STATE ROAD 100 CORRIDOR COMMUNITY REDEVELOPMENT AREA Property Acquisitions June 15, 2010 Presentation for SR 100 Board/City Council Meeting. STATE ROAD 100 CORRIDOR COMMUNITY REDEVELOPMENT AGENCY Bulldog Drive Improvements Right-of-Way and Design September 21, 2010 Presentation for SR 100 CRA. BCC DISCUSSION ITEM Proposed Amendment to Hickman Billboard Agreement of August 14, 2000 June 18, 2013. Mandatory Refuse & Recycling Collection Services Tentative 2016 MSBU Utilities Department June 30, 2015. Crime Prevention Cameras in the Public Right-of-Way Orange County Board of County Commissioners January 13, 2015. Property Appraiser and Tax Collector Office Space Update July 8, 2014. 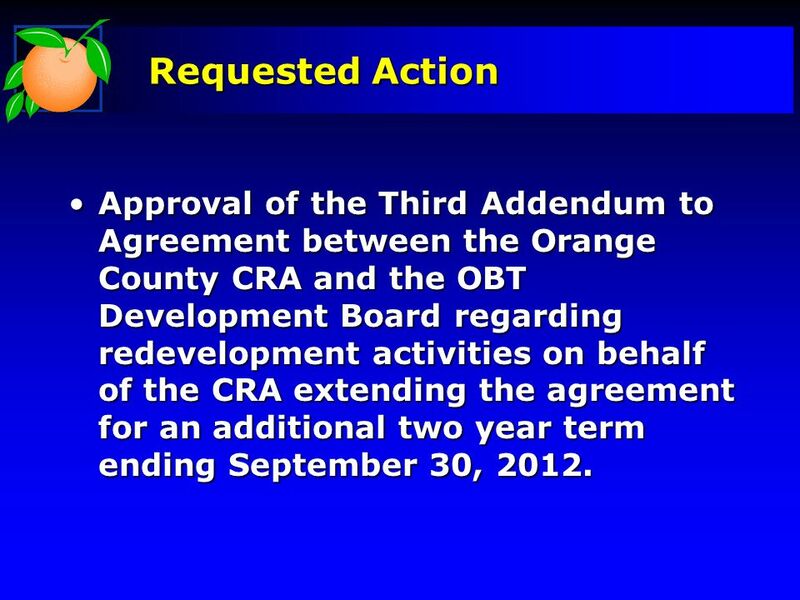 Interlocal Agreement Between the School Board of Orange County and Orange County Information Systems & Services May 25, 2010 Information Systems & Services. The Dori Slosberg Driver Education Safety Act October 21, 2014.